Thus we tend to think that “Loma” foes, like WBO counterpart Jose Pedraza, this coming Saturday, December 8, have no chance to better the Ukrainian. And then a Jorge Linares will buzz a Loma and remind us that these things have to play out; upsets happen and boxing is the theater of the unexpected. I expect, though, that Loma has his hand raised Saturday at Madison Square Garden, and on ESPN, atop a show promoted by Top Rank. 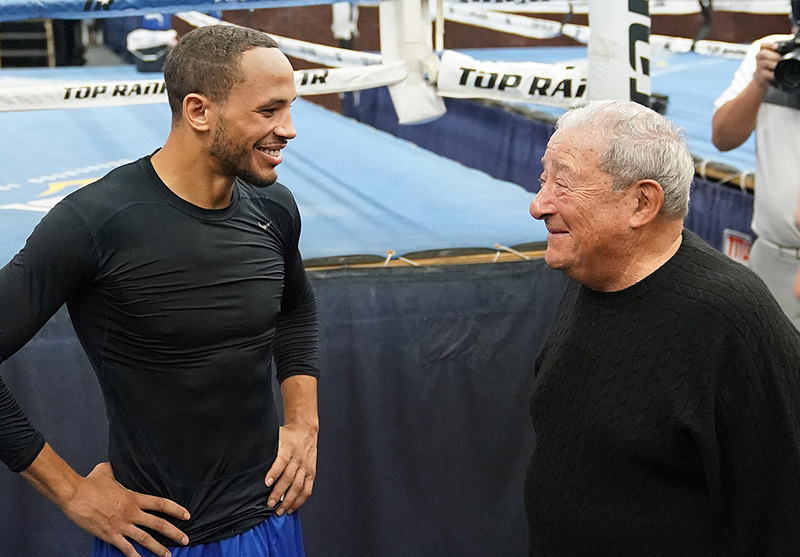 The head man at Top Rank, Bob Arum, joined us on the latest “Talkbox” podcast, powered by Everlast, and, no surprise, the all-time, all-star deal-maker said he thinks Pedraza has a chance to beat the master pugilist Loma. “Pedraza has a good style for Loma,” Arum said, after I noted I didn’t think he had a decent chance to win. “He’s convinced that he can win the fight and he’s going to give Lomachenko a good fight. I think it’s gonna be a very competitive fight. Loma, as he showed against Linares, it doesn’t seem he’s as dominating at 135 as he was at 126 and 130.” He noted that WBO junior featherweight titleholder Isaac Dogboe is on the card, as is Teofimo Lopez, so overall, it should be a solid show, in his mind. We talked super-fights…and sides of the street. Is the current atmosphere making it harder to make the super-fights? Does it make it harder to make A-side fights because everyone wants to put them on their platforms? Naw, Arum said; people generally cooperate. He works with Lou DiBella and Main Events’ Kathy Duva…but yes, it is difficult with Al Haymon. I also asked Arum who has the inside track on signing former unified middleweight titlist Gennady Golovkin. Is DAZN going to land him and not ESPN? “Nobody is ahead of ESPN; forget about it,” said Arum. 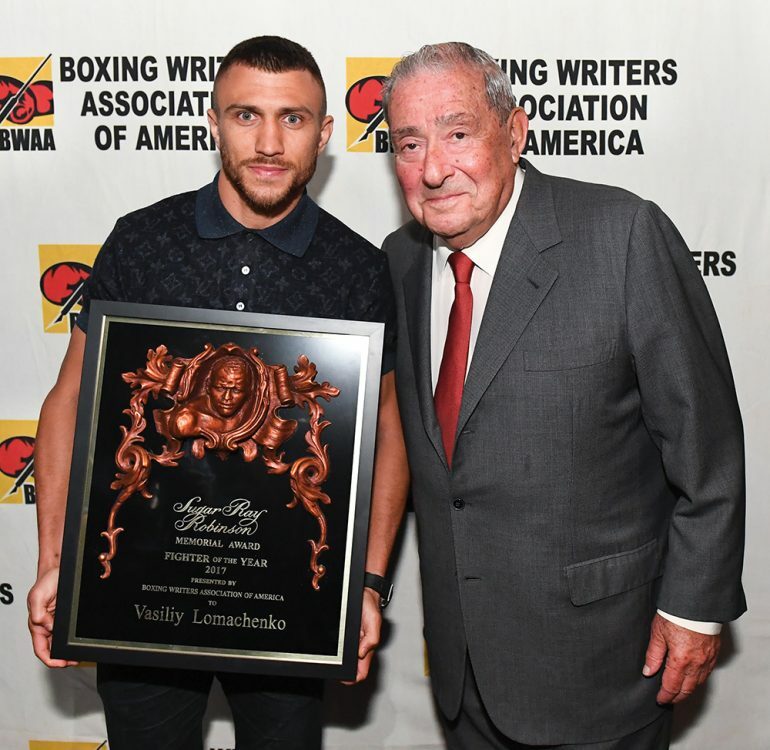 Brooklyn-born Bob also lauded newly-crowned WBC light heavyweight beltholder Oleksandr Gvozdyk, who got the W against Adonis Stevenson on Saturday. Stevenson suffered brain trauma but is now in stable condition, upgraded from critical. Arum said he more so would watch as a fan and not as much about the gate and the pay-per-view eyeball number. 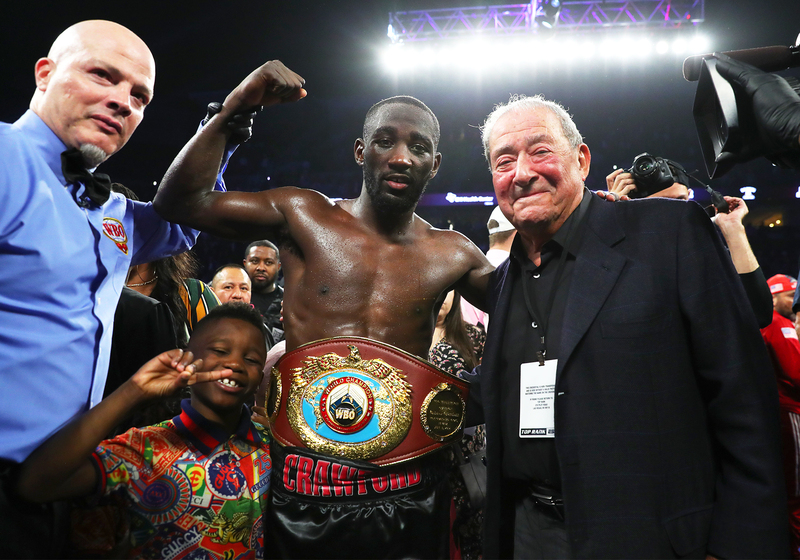 And what’s next for WBO welterweight titlist Terence Crawford? Rumor says March, versus Luis Collazo but Arum said that wasn’t a done deal. Collazo could well be the foe, he said. As for IBF/WBC lightweight beltholder Mikey Garcia, Arum wanted him to fight Crawford and then Loma but Garcia took another direction. 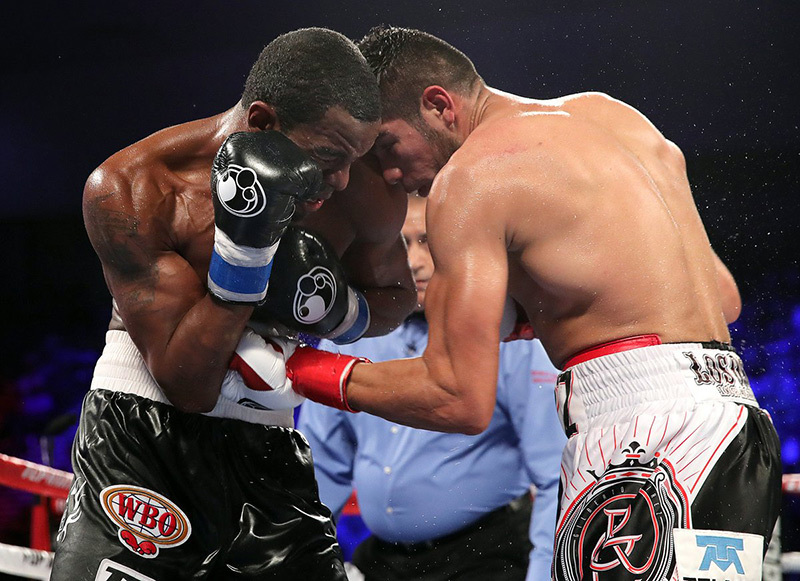 “I look at it as sort of a stupid fight for Garcia. Of all the guys to pick a big welterweight who is really a junior middleweight…I don’t know why Garcia took the fight, neither does (trainer/brother) Robert or his father. Mikey beats to the tune of his own drummer,” Arum shared. And what about the beginning of 2019? WBO featherweight beltholder Oscar Valdez will fight in January and former world heavyweight title challenger Bryant Jennings is slated to rumble, as is undefeated featherweight prospect Shakur Stevenson, at Turning Stone. Middleweight Rob Brant will tango in February and, on February 2, we will see Top Rank and Main Events hook up, in Dallas, to offer the Eleider Alvarez vs. Sergey Kovalev sequel for Alvarez’s WBO light heavyweight title. TR has three shows running in February, Arum shared. How about the spate of PPVs…Is that bad for boxing, Bob? The promoter said Crawford may have two super-fights and at least one for Loma, the Las Vegas resident said. If Loma beats Pedraza, then he will fight the winner of the Richard Commey-Isa Chaniev fight. (The IBF 135-pound belt is up for grabs in that bout.) Also WBC junior lightweight titlist Miguel Berchelt versus Lomachenko might be put on PPV in 2019. 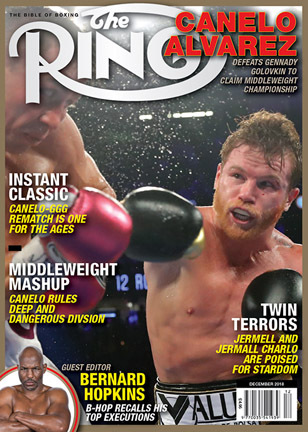 There ya go…Lots of news and opinion from Arum, as per usual. Listen to the pod here.